Kaymu.com.bd, founded in 2012 by Rocket Internet Gmbh, the largest internet company outside the US and China, has now expanded to mobile marketing with the launch of its Android Mobile application on the 1st of October , 2014. Since its launch, Kaymu has evolved into a global brand and grown exponentially to become Bangladesh’s number one online marketplace.It takes advantage of the rapid growth of e-commerce in the country, with more than 500,000 people visiting the website monthly to enjoy its offerings. Kaymu provides a platform for buyers and sellers to interact virtually and agree the best deals when it comes to new products, such as smart phones, computers, fashion and clothing, home appliances and others. The application has been developed with the vision of making services like buying and selling online faster and more convenient, with features that enable the sellers to take pictures of and upload products and the buyers to select from a wide variety of products at a glance. In the context of the revolution that is the rapidly growing mobile marketing in Bangladesh, the more conventional and archaic means of buying conducted via telecommunication or direct selling are taken one step further by acclimatizing the masses to a more technology-based and structured forum that will be provided through the Kaymu Mobile App. The Kaymu Android App features unique services to improve its users’ experience, such as a shipping fee calculation system to organize more personalized and cheaper deliveries, as well as multiple payment methods in a safe and secure transaction system. There has been a significant and continual growth in the use of Android phones in Bangladesh. As per the statistics provided by the Bangladesh Telecommunication Regulatory Commission (BTRC), mobile internet users reached 37.85 million at the end of July this year thanks to mobile technology driving internet penetration. Kaymu is trying to tap into the potential cache of consumer masses by developing its app on Android to allow the shopping experience to be at the users’ fingertips. The Kaymu Team is constantly working towards building a world-class online shopping experience on Android, and strongly believes that they will be at the forefront of innovation in Bangladesh.The app, which is completely free, can be downloaded from the Google play store. 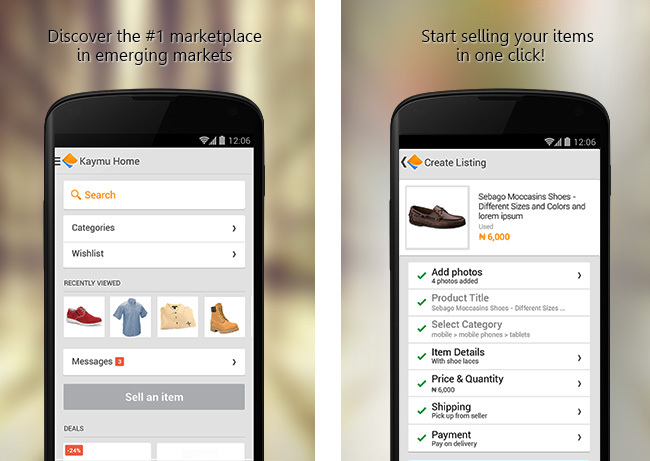 Kaymu is the largest and safest online marketplace for emerging market. It connects buyers and sellers to allow them to take advantage of the best deals on an extensive range of products including electronics, books, fashion items, gadgets and even cars. Thanks to a fixed price system, Kaymu guarantees that users will always find the lowest prices on the market. The Asia Pacific Internet Group (APIG) supports some of the leading internet companies in the region. Founded by Rocket Internet in 2014, the APIG’s mission is to promote innovation and entrepreneurship throughout Asia and the Pacific, as well as to support the development of a vibrant online culture. APIG’s network currently consists of 10 companies, operating in 15 countries.